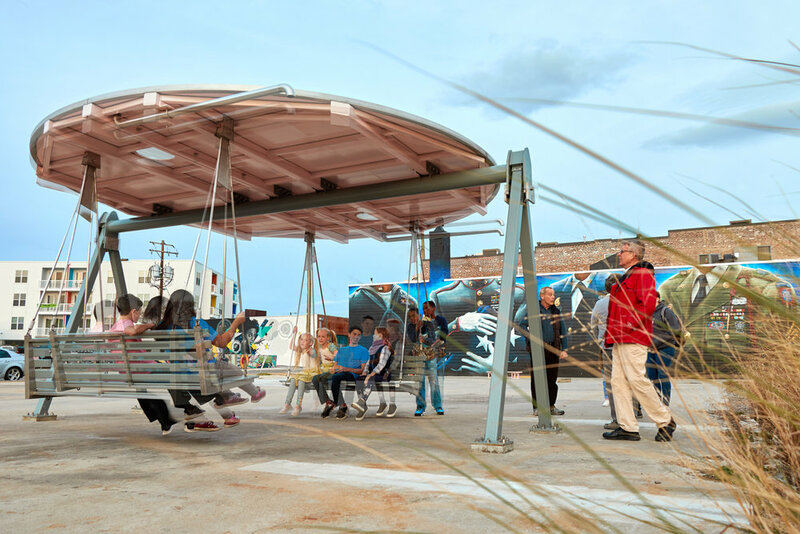 The canopy teeters like a seesaw as people sway on the benches. When it rains, water is funneled from the roof through drainpipes to troughs on the ground and then to the adjacent rain garden. By teetering the canopy, those on the benches can determine from which pipe the water drains. The muse for Upper Blush is an issue critical to Norfolk’s future—rising tides. The circles of light on the ground created by the skylights reference the moon and the teetering and swaying mimic the ebb and flow of the water. The human interaction that influences the balance and the flow of the water serves as a metaphor for larger issues associated with floodwater management.